Le Cheval au Naturel The Natural Horse: There was grooming, and now there is gentle grooming - a brand new tool takes the horse world by storm! 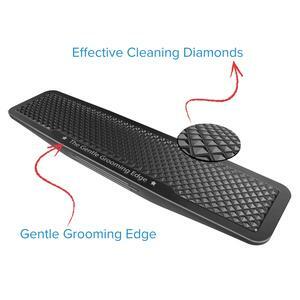 There was grooming, and now there is gentle grooming - a brand new tool takes the horse world by storm! If you have not heard yet, I discovered StripHair Gentle Groomers last year and loved them so much, I brought them into Eastern Canada. I am the proud owner of three greys and I totally love my Striphair groomers! So does Pat Parelli, as you can see in this great demo he gave while teaching a masterclass in Markham, Ontario in 2016. Check out how easily it cleans up this horse while providing a nice massage. The horses love it and you won't believe how slick, shiny and smooth the coat will be after only a few groomings. Works just as well on winter coats and wet, muddy horses. No blades, no harsh edges, and doubles up as a lovely massage tool. Dogs and cats love it too! A feeling your horse will love. from Betty on Vimeo.